Most people are aware that moving is one of the more stressful events that an individual can experience. Add to that the burden of being an older adult who has lived in his or her home for decades, and is now in ill health, in rehab recovering from a fall, and cannot return home to live. Or consider the situation of an elder living with dementia whose memory and self-care skills have worsened and who must now be transferred from one level of assisted living to skilled nursing care. Both of these cases involve stressful situations that are complicated by age, poor physical and/or mental health, and the reality of having to surrender some measures of independence that the individual would likely prefer not to. Moving isn't easy for anyone, but elders who must make major life transitions are particularly vulnerable to the high stress of relocation, also known as transfer trauma. Our cover story explores who is at risk, the signs and symptoms, and what can be done to prevent or at least minimize the risk of transfer trauma in older adults who must relocate at this tenuous phase in their lives. 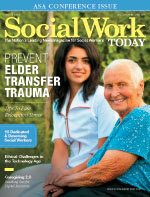 Also in this issue is "10 Dedicated and Deserving Social Workers," our annual tribute to those who have been nominated by their colleagues, students, and coworkers for outstanding accomplishments in the social work profession. We realize there are so many other social workers who also deserve to be honored and hopefully we will get to you! We are grateful for your service to your clients and to social work, and for the commitment of these 10 social workers to professional standards that warranted recognition by their peers. Congratulations to these 10 social workers and to all who have chosen this profession of service, compassion, and advocacy.